Schenectady proper is flush with hotdog stands (Mike's, Newest Lunch), but go outward in Schenectady County and the same quality of hotdog can be tough to find. But now in western Rotterdam, there is Pete's Pups, which relies on Helmbolds mini dogs and White Eagle sausages. 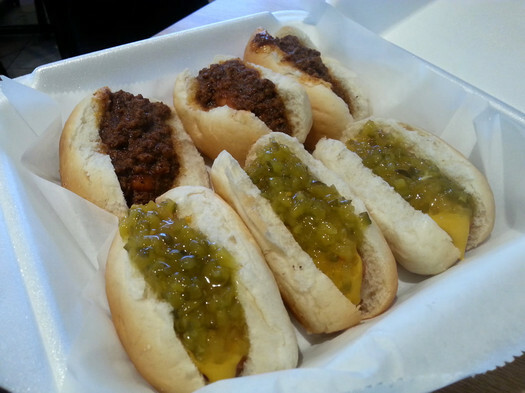 Many of the toppings are made in-house, and that goes for the meat sauce, which is the icon accoutrement for Capital Region mini dogs. 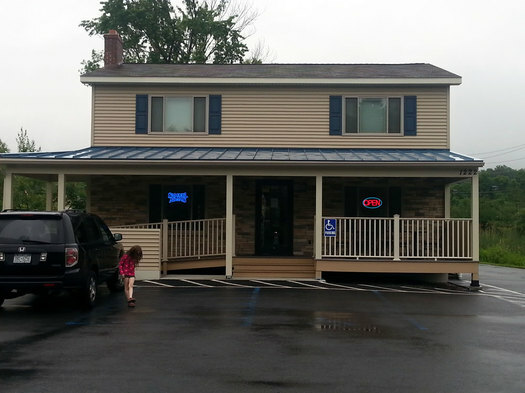 The location of Pete's Pups is right next to a popular truck stop, at the junction between I-88 and I-90, and abuts a State Trooper outpost. Its presence is a smart marketing move, as hotdogs are quick and portable, and grabbing lunch or an easy dinner here is a good option when the only other prospect is a gas station Dunkin' Donuts next door, or something from the hot case of death so prevalent in convenience stores. But none of that matters if the food doesn't measure up. Pete's is smart in sourcing from a trusted local brand. Throwing one's hat into the hotdog ring is a surefire run though the gauntlet around these parts, but Pete's limits risk and potential criticism by relying on the same brands most other hotdog vendors here use. So if you've ever had a mini dog locally, Pete's tastes about the same (including that "snap" of the skin on each tube of meat). The flourishes that each place employs are what set them apart from the competition. Pete's does this by way of meat sauce. Crumbled meat in a spiced tomato sauce is what you'll find here, but do not confuse "spiced" for "spicy." Pete's meat sauce is earthy and round with cumin, cinnamon, and paprika (almost a garam masala-meets-goulash taste), but lacks any discernible heat. The flourishes that each place employs are what set them apart from the competition. Pete's does this by way of meat sauce. Crumbled meat in a spiced tomato sauce is what you'll find here, but do not confuse "spiced" for "spicy." Pete's meat sauce is earthy and round with cumin, cinnamon, and paprika (almost a garam masala-meets-goulash taste), but lacks any discernible heat. Opt for pickled hot peppers atop your meat sauce if you need more kick. I prefer my litter of pups with mustard, relish, and chopped white onion: A hard order to fudge. By the name alone, Pete's Pups is most definitely a hotdog specialist. Do not overlook what else is on the menu. The sides are all excellent (especially the macaroni and cheese), and save room for a Creamsicle float. Pete's is all about the deal, too, so you can get a filling meal (with drink and dessert) for less than $10. Wish we had a Pete's Pups here in the Pine Hills! Reading All over Albany makes me want to eat all of this delicious sounding FOOD, and contribute to my weight gain! Also, "crumbled meat?" The meat should be almost liquified. I just received an email from a 65 year old women who shared a scene from her childhood of watching a man at Charlie's in Troy periodically "mashing" the meat in a cauldron of sauce with an unknown implement. There should be no "crumbles." The tomato is another issue. I don't necessarily hate the idea of tomato in our local hot dog sauce, but if it is anywhere near a prominent flavor profile I reject it. I might actually have to try these. But by your description I am pretty sure that I will hate them. If you are going to ape the local style, it has to be done well. Anton's in Albany is a good example of a place that hasn't (I think) been around forever but does a damn good sauce. Anyhow, how was that for a vitriolic hot dog nerd rant... Sometimes I wonder about myself. "The Daily Meal" website released its list of the 75 best hot dogs in America and there was not a single Cap District place on the list. Your review shows what a travesty that is. I do sometimes route myself through Sch'dy to get on the Thruway and will plot Pete's into my itinerary next time. Thanks! Yay, I live a few miles away and am really looking for a few places to get a quick bite for dinner. I will add this place to my list, thank you for letting us know!